Red poodles are a recent addition to the poodle spectrum, and are till relatively rare. They developed from the apricot line, and until quite recently, there were so few that breeding two reds was very difficult. Here at Homestead Poodles, we love our reds, and are working hard to continue and improve the line. Red poodles are now accepted in American Kennel Club conformation shows. 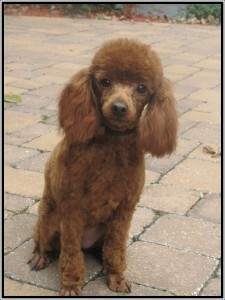 A well- groomed red poodle is a striking sight, with a coat that seems to glow from within. Slightly darker feathering on the ears and tipping on the ruff is acceptable by AKC standards. Since red poodles are still comparatively difficult to find, demand has driven prices up. That can lead to unscrupulous breeders trying to get a lot of red puppies on the market. Buying from a reputable breeder is important with any dog, but is especially essential when buying a red poodle. Like all poodles, red poodles don’t shed, which makes them an excellent choice for allergy sufferers. Their coats should be brushed thoroughly at least every other day to keep them from getting tangles and snarls. Red poodles look particularly gorgeous with a Continental clip, especially when the sun hits their fluffy “jackets.” One caveat: if you’re out walking a toy red poodle, be prepared to stop and talk with passersby! They’re going to want to talk to you about that striking creature on the end of your leash.